Stay tuned for upcoming events for Alka Yagnik in near future. 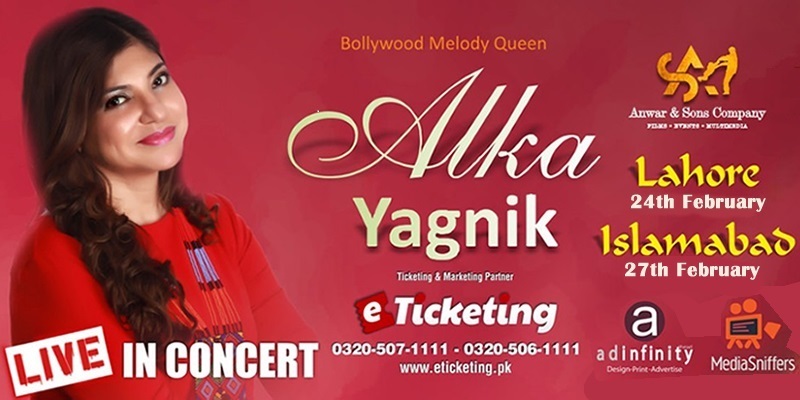 World famous Indian playback singer Alka Yagnik is set to tour Pakistan in 2018. These melodious music concerts are being organized by Anwar and Sons Company. Alka will perform soon in Lahore. Alka will play on a live musical gig at Aura Grande in Islamabad. Music fans can enjoy the evergreen Bollywood hits in the mesmerizing voice of Alka Yagnik. Come and be the part of shows featuring Alka Yagnik, the acclaimed Bollywood melody queen. Alka Yagnik is popular singer from India who sings in the genres of Bollywood and regional film playback singer. Alka has a successful career spanning over three decades in Hindi cinema. She has won Filmfare Award for Best Female Playback Singer for a record seven-time from record 36 nominations. She has also received the National Film Award for Best Female Playback Singer twice. Anwar & Sons Company is a multimedia production firm which makes and distributes films in Pakistan and UK. It also organizes music concerts and other entertainment events. Terms & Conditions : Anwar & Sons Company reserves the right of admission to the venue and event. Best Viewed at 1024 x 768 pixels and above. This Page loaded in 0.089 seconds on Tue, Apr 23, 2019 (20:56).